The Amish McCoy Mission Glider Swivel belongs in your living room furniture collection. Set up a favorite place to relax in front of the fireplace or positioned near your entertainment center in a chair built with your comfort in mind. 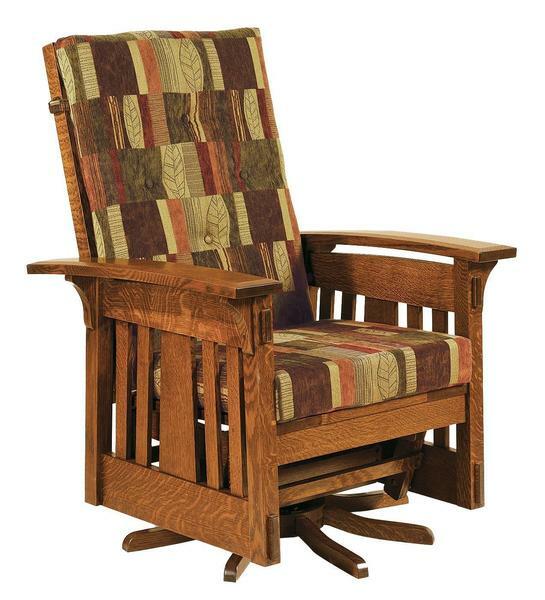 Gorgeous woodworking reflecting classic mission style is featured in the base of the chair with rich slat work showing off the wood you select. You have comfort options all around with this multi-faceted chair. The built in glider offers you smooth motion as you watch your favorite movie or glide into a nap. The swivel brings in the fun side to side movement that will make this lounge chair a favorite for all. Make a McCoy Mission furniture part of your fine furniture collection today knowing it's living room furniture that will stand for generations to come. This custom chair is 32" wide and 34" deep with a spring seat bottom offering support and lovely through tenons revealing the beauty of Amish construction. Pick from a collection of fine wood species, all sourced here in America. Order stain samples to find the perfect finish. Mission style furniture like the McCoy blends beautifully with a traditional or contemporary furniture collection. The versatility of mission style is one of the many attributes that keeps it a sought after style. Browse more of our mission style furniture for other areas of your home. There's no need to waste time going from store to store. Shop online today and create the exact glider that's right for you. Email or call us with any questions about our living room furniture. We can be reached toll-free at 866-272-6773.